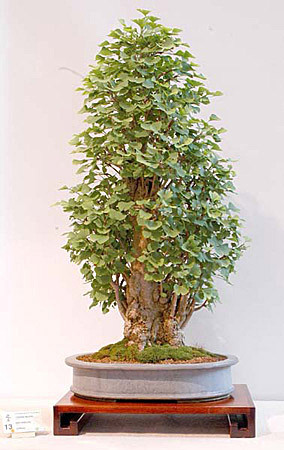 Challenging the Bonsai A to Z entry for Gingko Biloba (Maidenhair tree). This is a deciduous tree, once thought to be extinct but re-discovered in China in the 17th century. Columnar shaped tree with dense upright branches which bear distinctively shaped leaves which turn from green to pale yellow in autumn. Although the Ginkgo is more like a conifer than a deciduous tree it is neither. Recent research suggests that it has a unique position which is much closer to the cycads than to either conifers or deeciduous trees. STYLE : best suited to formal upright and clump styles. WARNING : Keep tree from prolonged freezing. Fleshy roots can "explode" as a result of excess water expanding when it freezes. REPOT : In spring annually up to 10 years old and then every 2-3 years as required for older specimens. SOIL : Free draining soil : 40:60 grit:organic. PRUNE : Prune all dead material in early spring. Prune new shoots to shape as necessary. PINCH : Prune shoots to a leaf pointing in the required direction. WATER : Water well in growing season. Keep soil barely moist in winter. FEED : Balanced feed in summer, then nitrogen free in early autumn. There are 819 entries in the A to Z and the pages have been viewed 3061180 times. Help us to increase the number of relevant bonsai terms included in this A to Z of Bonsai Terms. We include manufacturers and dealers in the dictionary, if you are one or know of one not mentioned then just click the link above and add an entry. If you have a favourite bonsai tree not mentioned just add an entry. We are trying to create a unique single free source for all bonsai terms and hope to capture worldwide bonsai terms for bonsai trees, bonsai clubs associations and national collections and the A to Z is free marketing for bonsai businesses and bonsai clubs.